Some brides wear their wedding dress once, then store it for posterity. Others give the garment a second life by donating it to charity. Newlywed Natasha Samuel recently did the unthinkable: She poured gasoline on her dress and set it on fire – while still wearing it. Israeli photographer Erik Simantov captured the stunt in May on video, as well as in a series of photographs. He told TODAY.com that the photo shoot was part of the “trash the dress” trend, in which brides destroy theirs gown and it’s all caught on camera. 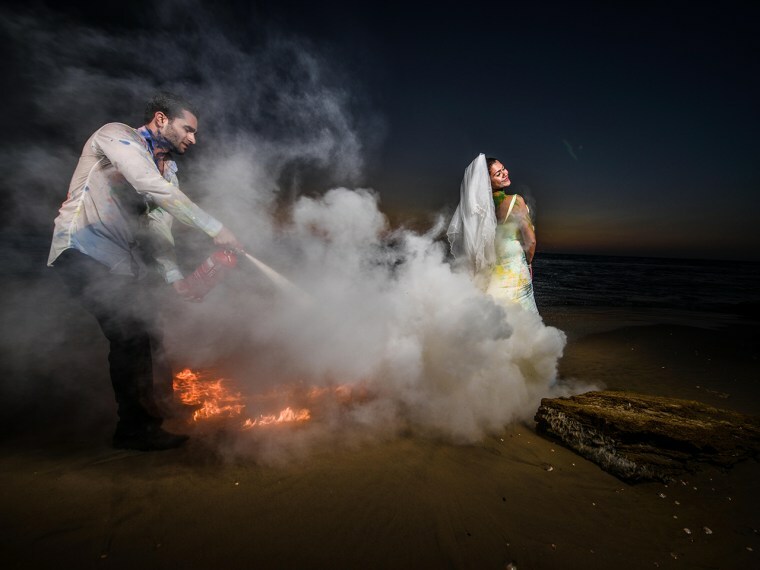 For the past two years, the Tel Aviv-based Simantov has documented brides as they playfully – sometimes artistically – tear their dresses asunder, but this is the first time he’s set a bride on fire. Simantov didn’t attempt the photo shoot without a lot of preparation. He spoke to firefighters to make sure that the dress fabric wouldn’t ignite and burn more quickly than the blaze could be put out, and first tried the stunt on a mannequin. After that worked, Simantov arranged to photograph the scene at a beach, so Samuel could dart into the waves seconds after the dress was lit. He placed two fire extinguishers and other safety equipment nearby, and put the gasoline canister at a far distance to avoid an accident. Somehow, he managed to photograph Samuel smiling proudly back at the camera as the train of her dress caught fire and flames began creeping up her back. The jarring image has been popular in Israel, Simantov says, and he's since received a few inquiries about reenacting it with other brides.